In 1884. RIVAL. griffon d'arrêt français, 20 mois. MARRON ET GRIS, mélangé(...) 1er prix et médaille d'or Paris 1881.à M Emmanuel Boulet.Elbeuf. 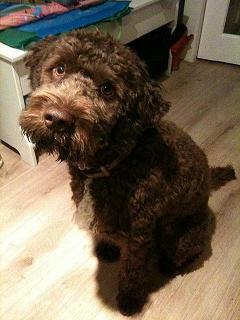 RALPHE, barbet griffon mâle, blanc et taches oranges...oh my. If either of these 2 colors comes out in a litter? oh, my. Gray-black...there is not a comma between gray and black, as there was by mistake afterwards.. there were no gray Barbets and after a short exchange yesterday with another Barbet historian, I still comme to the conclusion that there were no solid black Barbet*, meaning Griffons, back in those days. 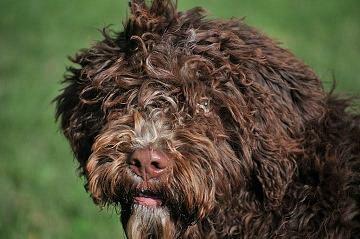 This Barbet looks a lot like the one the standard was written for in 1891( and validated in 94). 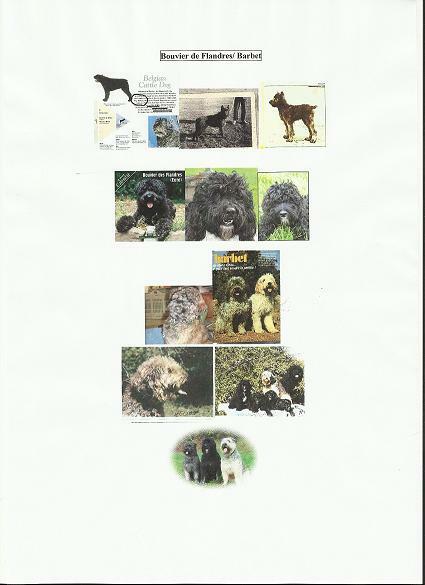 Visualize her with gray mixed in with the brown.... or even some black and we're back to the Bouvier de Flandres( or some other shepherd breeds), and R'Lucky the Barbet registered in 1968, Hera, >Helios and then some. All in the Barbochos Reiau de Prouvenco. Then, you can begin to understand how it is all coming together. Of course, there are probably some exceptions and soem black Barbets probably did exist, but were they Griffons? Not sure. The Black color, could have come in the 1970's/80's from the Chien de Crau. Not that far away!
" Show me the Mother, the Father, the siblings". Homogeneity? What do you know about ancestry, character or any problems? Have you seen photos of the ancestors and which traits they sent down? What is the objective of having the dog? You looking to help save the breed or??? Mating just about anything to just about anything else is suicidal. These people are also present at most dog shows, in France. It has taken a couple of weeks,me not having a warped mind, to try and figure out what warranted the xxxx pages document( all rehash) sent around by the Barbet re-incarnator who had gone silent since the elections...Mighty strange.There was nothing new in it but something prompted it. 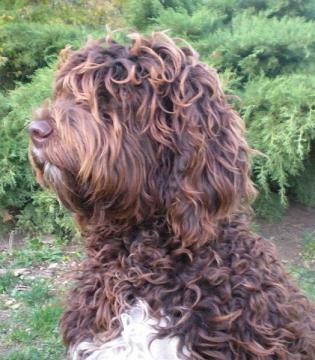 I guessed me saying the Barbet was a "silky coated" dog may have. I had to take the time to think and find elements to prove what he is saying is totally false. One with long and silky coat, and the other with a short harsh coat( meaning the Korthals). written by the Baron Bellier de Villiers. remember the standard was going to be written in 1891. It says any coat color not accepted in the standard...2006, below, is not accepted. COLOUR: Solid black, grey, brown, fawn, pale fawn, white or more or less pied( pied meaning white and balck or vice versa, ouf because that is also a PWD color). All shades of red-fawn and pale fawn are permitted. [color=#FF0000]The shade should, preferably, be the same as the colour of the body. as long as it doesn't come from 1970 or before, anything is admitted? What is this color business doing? How many are really concerned? OR are we anticipating more Heras or R'Luckys coming out to prove that recessive genes come from somewhere? AND must be abolished along with any "old blood" that could come out? As most/all know, one of the first self proclaimed missions of our resposible was wanting to enforce the non- confirmation points of the Barbet. Nothing about short ears, short tails or tail over the back, or no angulations.Of course not. Nothing about all the different shapes and ( sizes)morphology we see ( genetic diversity? )...meaning no homogeneity in the breed or very little? No. Only colors, and the eternal poodle tight frizzy curls. 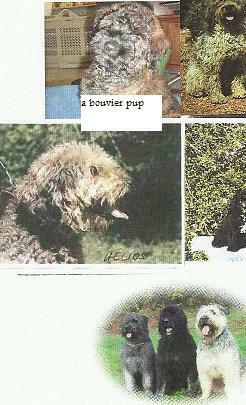 The Bouvier as an example....since there is Bouvier in the Barbet. ( and vice versa)Hard to tell! Bottom line...It's the breed who is losing.